Matt and I went to Millbrook Horse Trials yesterday to watch the best of the best riders in the country ride in the Advanced division. As predicted, there were many exclamations and comments that only Matt could make, some of which I'll share soon. I got some great video of the jumps and the rides, so I've got to upload them and see if I can conjure up some media magic. In the meantime, we had our own obstacle today. 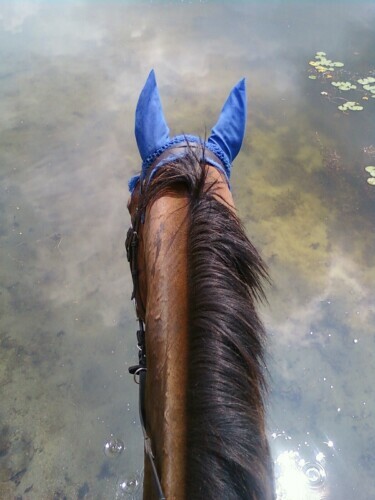 Zeus hasn't done a water obstacle yet, and if I'm entering King Oak, I do believe there's a small water element on course. We're very fortunate that we can ride in certain places in our neighborhood due to great neighbors we're lucky to have. One such neighbor has a lake. Yup. Water obstacle? How about a lake? For added difficulty, we tossed in some sailboats for good measure. Zeus, who isn't a big fan of walking through a puddle, wasn't too keen on going in. I can't say I blame him - there's no end in sight to that water. However, with a little bit of coaxing and some moral support from big brother Snoopy (who I *still* have to blog about! ), in he went - and he didn't want to come back out. 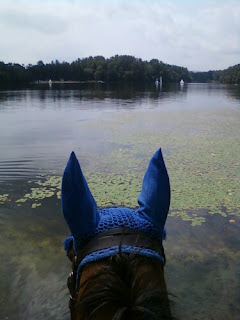 I figure if we can handle a lake, we can handle any water element on a XC course! After a few trips in and out of the lake, Zeus would point himself at it without any prompting from me, and trot in like it was a fantastic game. He'd then splash through the water with his nose down. Matt said it was like watching a child discovering the joy of sprinklers. I wonder if we'll be the first horse and rider team who gets eliminated because my horse will not get out of the water at a horse trial. I use them mainly out on trail because this time of year, the deer flies and other bugs can make the horses crazy. I actually spray the bonnet with fly spray and that really helps. Zeus in particular is very sensitive to the bugs, so I give him as much protection as I can. I also tend to use brightly colored bonnets during hunting season while on trail - the less we look like a deer, the better! My mom used to put sleigh bells on her saddle...somehow, I think Zeus would take exception to that! I am a trainer for CANTER New England and my husband and I own Thunder Moon Farm, where we keep our own horses, train client horses and teach riding lessons. I'm a mother to a beautiful and sassy little girl.